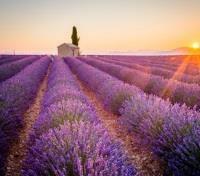 Enjoy a picnic in a lavender field, and learn of the processes during a lavender factory visit. 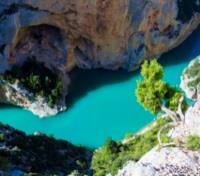 Admire awe-inspiring views of the aquamarine Verdon Gorge, with private guide. 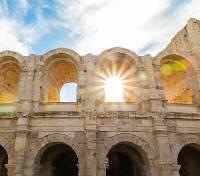 See impressive Roman amphitheaters in Arles and Orange. 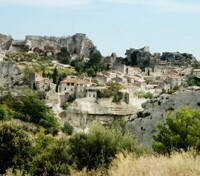 With a private guide, explore the hilltop town Les Baux de Provence. Luxury accommodations from beginning to end. 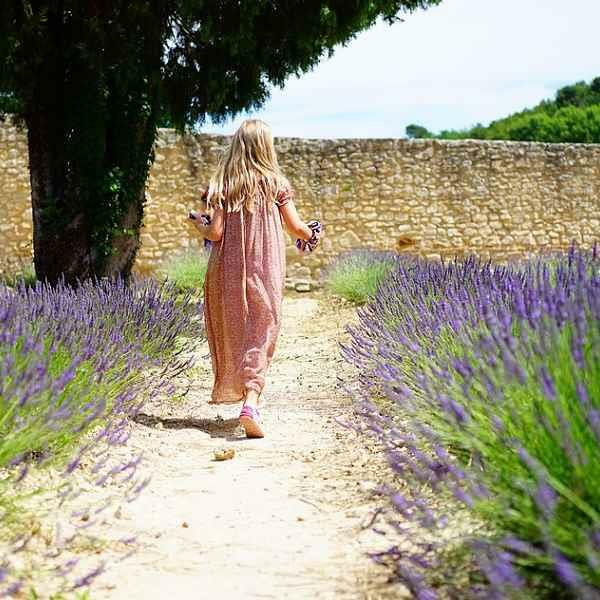 Roving fields of lavender set a spectacular backdrop for this private-guided journey through the back alleys and country roads of picturesque Provence. A luxury offering, InterContinental Marseille Hotel Dieu is set in a superb 18th-century building in the historic quarter of Marseille. Perched atop the Panier Hill, in what is the oldest district in Marseille, the hotel is a quarter mile from the world-famous Vieux-Port, the cultural and historic center of France’s second largest city. The grand U-shaped stone building features tall arched windows framed by local golden-hued stone and masonry. Guestrooms and suites offer contemporary, elegant decor, complementing the building's historical features, and gastronomy is never an afterthought, with an on-site restaurant led by an award-winning chef aimed at being the leading light in Marseille and the Mediterranean. When it's time to relax, sip cocktails in the Capian Bar, or rejeuvenate at the on-site spa, complete with saunas, hammams, an indoor pool, and sunbeds. Embark on an exciting private day trip encompassing two French Riviera favorites- vibrant Marseille and the ancient fishing port of Cassis. 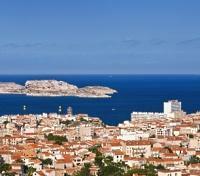 Meet your driver-guide at your hotel and travel south to the seaside town of Cassis. Drive along the scenic Corniche des Cretes road, stopping to admire sweeping, magnificent coastal views of the Gulf of Cassis from Cape Canaille. Head down to Cassis where you'll explore the charming fishing village, wandering along the gorgeous harbor, lined with colorful, pastel-painted houses. 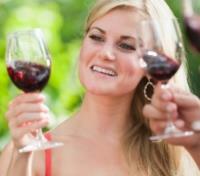 Enjoy some free time to browse the markets or perhaps scout out a seafront restaurant for a pause in your day. Later, rejoin your guide and hop aboard a shared cruise to discover the magnificent Calanques of Cassis, effectively the Riviera's version of scenic fjords. Be awed by the untamed nature as you glide past the jagged rock formations, soaring limestone cliffs, and tranquil inlets. Return to Marseille where your guide will take you on a relaxing sightseeing tour, and see historic highlights of France's second largest city, including the hilltop cathedral of Notre-Dame de la Garde, the 5th century Abbey of St Victor, the Old Port, and the stunning gardens and fountains of the Palais Longchamp. 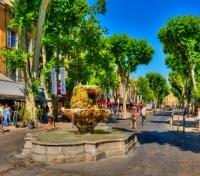 Meet your driver-guide and transfer to the chic and bohemian Aix-en-Provence. Upon arrival, enjoy a wonderful walking tour, immersing yourself in the beauty of the city as you stroll along the picturesque streets, lined with centuries-old private mansions with lavish facades, elaborate fountains and quaint cafes. Spot the town's 17th century cathedral built on the site of a former Roman forum, walk the beautiful tree-lined Cours Mirabeau with the 19th century Fontaine de la Rotonde, and stroll past the Deux Garçons, the famous 18th century brasserie frequented by Ernest Hemingway. 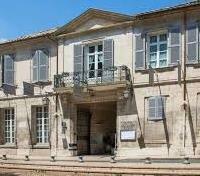 During the course of your tour, you'll visit the museum of Atelier Cézanne – a studio where the renowned post-impressionist artist Paul Cézanne created dozens of masterpieces, found today in the world’s best museums. You'll also make a visit to a santon manufacturer to see some exceptional pieces of these hand-painted clay figurines, a specialty of Provence. Offering the ultimate luxury experience in Provence, Le Pigonnet is an elegant country house that combines 18th-century refinement with contemporary luxury and style. A short stroll from the Aix en Provence city center, an authentic and peaceful Eden is created for every guest who walks through the door. 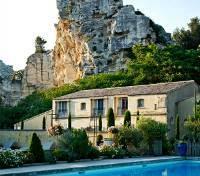 Le Pigonnet's 44 refined rooms and suites are a mix of a modern and classic French style, many of which overlook the hotel's 2-acre manicured garden where renowned Post-Impressionist painter Paul Cezanne would often walk with his easel to paint, admiring the Sainte-Victoire Mountain from afar. During summer, enjoy lunch on the sunny restaurant’s terrace under the shade of hundred-year-old chestnut trees, and during the cooler days, take pleasure in having a drink in the cozy Le 1924 bar offering a British club like atmosphere. Meet your private driver-guide and set out toward Verdon Gorge, admiring the beautiful scenery of rolling hills as you embark on a full day tour. Verdon Gorge (Gorges du Verdon), named after the river’s striking turquoise-green color, is a deep limestone canyon carved over time by the waters of the Verdon River, creating what is today a nature reserve, rich in flora and fauna, and astonishing scenery. Admire awe-inspiring views from the rim before descending to the end of the canyon where the river flows into Lake of Sainte-Croix, an epic expanse of beauty to behold. After spending some time at the canyon, continue on to the picturesque village of Moustiers Sainte-Marie, nestled at the base of dramatic and rugged mountain formations. Explore the narrow medieval streets, admire the old stone chapel of Notre-Dame de Beauvoir tucked up on the mountainside, and the perhaps even visit some of the ceramics shops for which the village is known. 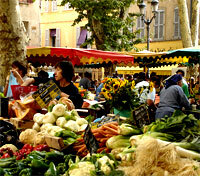 At the end of your day, return to Aix en Provence. Departing this morning with your private driver-guide, you'll transfer to Les Baux de Provence, making a stop in the ancient city of Arles en route, with numerous Roman relics. Upon arrival to Arles, marvel at the ruins of the impressive Arles Amphitheater. A UNESCO World Heritage Site, this 2,000-year-old structure formerly held up to 26,000 spectators in its prime. Outside of the town hall, you can spot a 4th century Roman obelisk that was pulled from the River Rhone and erected in the middle of Place de la Republique. Check out the exterior of the 4th century Baths of Emperor Constantine, and witness the ruins of the Roman Theater, even older than the Amphitheater, where stone has been impulsively stripped over time and for use in other projects throughout the city. Continue to Les Baux de Provence, named one of the most beautiful villages in France, largely due to its hilltop position and picturesque stone ruins of the upper old village and castle. Stroll through the quaint, narrow streets and picture the aura of 16th-century life here, when the village was thriving. End your day with a drop-off at your hotel. Both gastronomic institution and elegant country inn, Baumanière les Baux-de-Provence is a charming hotel in Provence that represents the Mediterranean art of living at its discreet, unpretentious best. The magical setting, spread across five different houses on a 50 acre plot of land, is the ideal backdrop to the art of hospitality practiced for the last eighty years at this family-owned establishment. The guestrooms are nestled amidst the peaceful, gorgeous landscape. The impressive on-site gastronomic restaurant, awarded two Michelin stars, delights its guests with an attention to perfection, while tranquility can be found at the spa and outdoor swimming pool. Today in the morning you will visit a lavender factory to immerse yourself in the aroma and learn how the essential oils are extracted from the plants. The lavender fields of Provence spring into bloom for the balmy summer months each year, blanketing the region’s fields with a vivid violet color. End the guided tour with a wonderful picnic in the fields. Later in the afternoon, your driver-guide will drive you along the beautiful Luberon valley to discover one charming Provencal village after another. Admire the cliff-top settlements, sprawling vineyards, antique shops and the postcard-perfect sights. Picnic lunch included. A visit to the Lavender Museum is included. 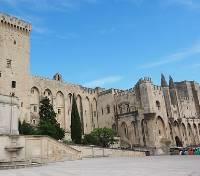 Meet your private driver-guide and transfer to Avignon. Upon arrival, you'll set out on a wonderful walking tour of the medieval city. Stroll narrow streets filled with history including the 1,100 year-old St. Peter's Church. Discover the iconic Pont d'Avignon, an iconic bridge which appears in nearly every picturesque photograph of this ancient city. 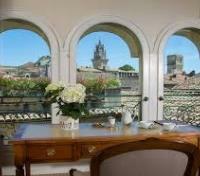 Walk up to the Rock of the Doms to enjoy its public gardens and a panoramic view of the city. No visit of Avignon is complete without admiring the massive Palais des Papes (the papal palace), one of the most important Gothic buildings in all of Europe. In the afternoon, head to the UNESCO-listed town Orange where you'll discover Provence’s ancient roots. Home to a Roman amphitheater and a beautifully preserved 2,000-year-old Triumphal Arch, Orange has thousands of years of history to appreciate. Conclude your day back in Avignon. 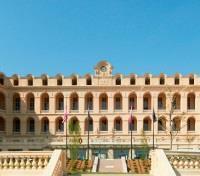 The luxurious Hotel d’Europe is one of the oldest hotels in France. Set in a 16th-century building in the heart of Avignon, it occupies a magnificent location just a 5-minute walk from both the UNESCO-listed Palais des Papes, and the picturesque Avignon Bridge. Built originally as an aristocratic townhouse, the hotel retains a sense of nobility. Its 44 rooms and suites are decorated luxuriously, yet simply, offering exceptional comfort. Hotel d'Europe creates a timeless place where hospitality is offered discretely, and with warmth, by a loyal and dedicated team of professionals. The on-site fine dining restaurant La Vielle Fontaine is idyllic, with a beautiful shaded terrace and elegant dining room, the perfect settings for enjoying local cuisine. With your private driver-guide, make your way to Chateauneuf-du-Pape, a lovely town in the Rhône Valley surrounded by prestigious wine estates. Marvel at the rolling vineyards, learn about the region’s distinct viticulture and terroir, and stop at a charming family-run estate Domaine de Beaurenard to taste some fine wine and tour the wine cellars. The Coulon family has been managing this estate for 7 generations, respecting traditional wine-making techniques, and their winery boasts an extensive catalog of vintage wines. Afterward, you'll make a trip to the unique Brotte Wine Museum, a must-see for wine fanatics, as it seeks to put guests "in the footsteps of the winegrower." Take some time to wander and see some impressive old wine making tools including a 16th-century press, before returning to Avignon. Meet your private driver and vehicle for a transfer to Marseille Airport. Approximate travel time is 1 hour.